Sam Gilliam (American, b. 1933 ), Situation VI–Pisces 4 (detail), c. 1972. Museum purchase, Otis Family Acquisition Trust and Kathryn Hurd Fund. Image courtesy of Joseph Goddu Fine Arts, Inc., New York. Sam Gilliam In Dialogue marks the debut of the Williams College Museum of Art’s recent acquisition of Situation VI-Pisces 4 (1972), a nearly 40-foot poly-propylene painted multiform that defies conventional definitions of sculpture, architecture, and painting. Originally created for exhibition at the Galerie Darthea Speyer in Paris, Situation VI-Pisces 4 can be draped over sawhorses and ladders, or suspended by rawhide from the ceiling in order to cascade through a painted wooden structure and pool into waves of color on the gallery floor. The size and lyricism of the installation invites innovative dialogues with the people and works of art surrounding it. In the spirit of Gilliam’s experimental practice, this exhibition will see a complete reinstallation of the gallery space three times, bringing both the work and the words of thirteen different artists in and out of conversation with Gilliam’s signature work, sparking different themes and interpretations. Gilliam’s pioneering use of abstract layers of pigment on un-stretched material actively unravels the all-too prevalent narrative that black artists excel solely in figural representation. The first installation, Race + Representation, acknowledges Gilliam’s groundbreaking presence in American art. On view from February 15 through April 22, this rotation addresses the difficult relationship between race, representation, and individual artistic practice head-on, putting Situation VI-Pisces 4 in dialogue with the work of Willie Cole, David Hammons, Barkley L. Hendricks, and Kara Walker. The second installation, Form, symbolically shifts the conversation from race to architectural form. On view from April 26 through June 3, it positions the Gilliam with sculptures by Melvin Edwards, Sol LeWitt, and Robert Morris as well as a painting by Joan Mitchell. This installation explores how these works of art use space and industrial materials architecturally, sculpturally, and as forms of experimentation. Topographies of Color, on view from June 7 through September 3, focuses on the visual, spatial, and emotional power of color. Joining Situation VI-Pisces 4 are a poured polyurethane work by Lynda Benglis, a stained canvas by Helen Frankenthaler, vertical stripes of color in paintings by Gene Davis and Morris Louis, and floating shapes of color in a Jules Olitski painting. 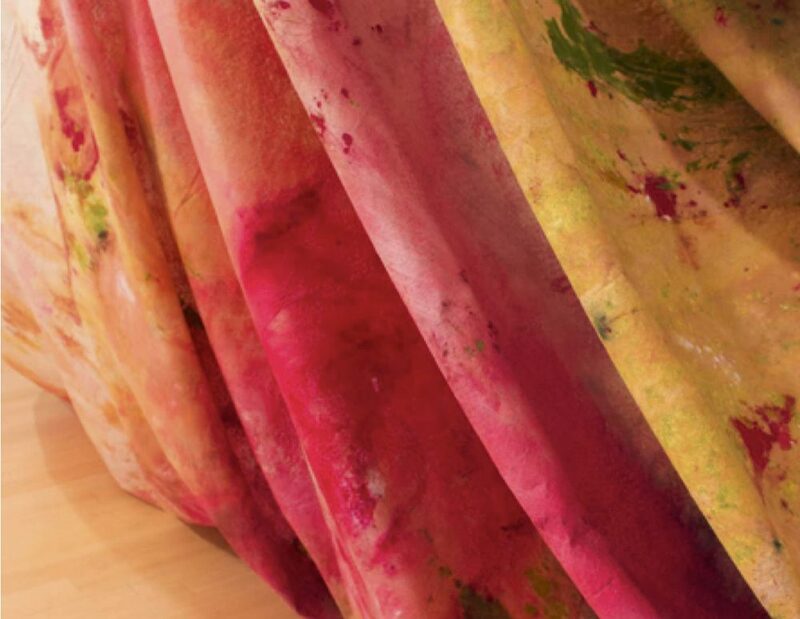 Sam Gilliam was born in Tupelo, Mississippi in 1933. He was raised and educated in Louisville, Kentucky, receiving a BA and MFA in Painting from the University of Louisville after a two-year stint in the Army. In 1962, he moved to Washington, D.C., and created large-scale, non-representational color field paintings alongside Morris Louis, Kenneth Noland, Tom Downing, and other artists loosely known as the Washington Color School. Gilliam began a relationship with the Galerie Darthea Speyer in the late 1960s and began traveling regularly to Paris, working with very large, unstretched materials which he draped and installed across walls, ceilings, fields, rock paths, and waterways to emphasize the relationship between the work and its environment. Since then, he has produced considerable bodies of work, ranging from geometric collage, etchings, watercolors, and quilted paintings to more recent forays into computer generated images and assemblage. Sam Gilliam was the first African American artist to represent the United States in the Venice Biennale (1972). He presented there again, to critical acclaim, in 2017. Gilliam’s work is held in major collections throughout the United States, and he has been the subject of numerous solo shows, notably at the Corcoran Gallery of Art in Washington, D.C., the Studio Museum of Harlem in New York, the Philadelphia Museum of Art, and the seminal 2013 Kordansky Gallery show in Los Angeles, curated by Rashid Johnson. Raise a glass to our spring exhibitions: Sam Gilliam In Dialogue, The Seeds of Divinity, Rawr!, and Object Lab. Sartre famously said “there is freedom only in a situation, and there is a situation only through freedom.” Assistant Curator Horace Ballard explores the philosophical connections between Sartre’s Situations and Sam Gilliam’s work Situation VI-Pisces 4. “Before painting, there was jazz” said Sam Gilliam, who has spoken at length about the impact of jazz music on his art. This series of jazz performances, organized in collaboration with the Williams College Music Department, respond to and resonate with Gilliam’s work and process. Jazz improvisations respond to Gilliam’s work in the gallery. Celebrating Sam Gilliam’s love of Charlie Parker’s music, Kris Allen and Avery G. Sharpe perform original arrangements of Parker’s music on the anniversary of his death.